Our Neck of the Woods: Reunited...And It Feels So Good! Our outdoor cat, Baby, is a free spirit. She has always lived strictly outdoors on this property and clearly enjoys her independence. When we bought the house, the seller asked us if we wanted to keep her since this is the only home she's ever known. Of course we said yes! I've never had an outdoor cat before, so I didn't know what to expect. She basically came and went as she pleased, and sometimes was gone for 3-4 days at a time. This made me nervous, but I tried to forget about it because she only ever disappeared for a few days before making her return. Over the past 6 weeks or so, one of the neighbor's cats has been coming over here. At first I thought he was a stray so I began feeding him. Of course once he knew there was food over here, he basically made this his home. Baby didn't like him at all. This is her territory and she didn't want him here. They would hiss and yell at each other a lot, but I never saw them get too physical. I guess Baby had enough, so she went away. I started to get nervous after the 5th day or so because that was a little longer than she'd ever been gone. Then a week passed, and today was the 10th day she had been missing. I was getting pretty scared and thinking of the worst case scenarios. I had a dream two nights ago that I went outside and there she was and I started crying. I have this weird thing where a lot of my dreams actually come true, so I was hoping that would be the case with this dream as well. Today when I was at work, David called and said, "Baby greeted me when I got home." I was caught totally off guard and I started crying hysterically! My reaction really surprised me. I guess I'm a lot more attached to her than I'd like to admit. We actually kept her in the garage for a little while to make sure she ate because she seemed like she had lost weight. She didn't like it much, and being the free spirit that she is I knew I had to let her go. 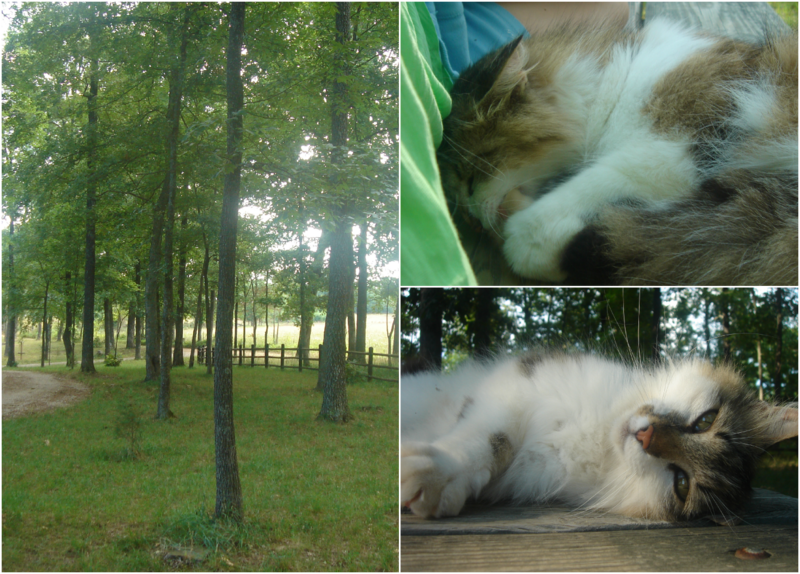 We went outside and she hung out on the picnic table with me for a while, then got up and walked off into the woods. I hope she doesn't go away for that long again. I don't know if I could take it! Aww, Baby cat! Glad she's home! When I was a kiddo, we had a cat that disappeared for months and one day just showed up again. If I remember correctly, he was was healthy so he'd probably had had a new family....not sure if he was nearby or or far away, but either way it's pretty amazing to know they can find their fams! Wow. I'll remember that just in case she disappears again! Also, make a note to yourself that any dreams involving me can only be good ones. Anything gets sketchy and you need to wake yourself up. Haha! Will do. I actually can wake myself up from dreams, so I'll be sure to do so if need be!